What's a Flight Officer? : Rescuemen? or a Flying Club? I was in Wal-Mart the other day, browsing the movies, and I came across "The Guardian". 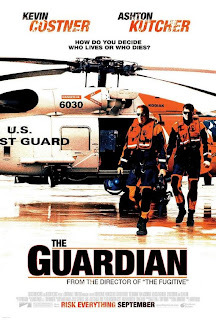 For those who don't know, it's about Coast Guard Aviation Survival Technicians, more commonly called 'Rescue Swimmers'. Costner and Kutcher are excellent in this portrayal of these unsung heroes. A must watch for anyone in the business of Rescue, but anyone calling themselves an American should sit down and watch this one. that call comes in, because that's my calling as far as I'm concerned. I never take that lightly, and I never short-cut it. At my squadron, most of our senior are pilots, and they do belong to what some would call the "Good Ol' Boys" club. Every week, the hot topic of conversation is who gets to rent the plane this weekend. There are exceptions, and yes, they do come through in the crunch, but sometimes, it seems as though us in the Civil Air Patrol loose sight of this fact. I know that I blogged about the new uniform earlier today, and so I'm as guilty as anyone else of focusing on frivolous things. I would say, however, that in light of the above, a renewed emphasis on the missions, and less on how cool we look.